Britain's worst and best online retailers named by Which? Homebase runs Britain's worst online shop, according to a survey by consumer group Which? The DIY chain's website was hard to navigate, offered poor value for money and was often not up to date on stock details, the survey found. SportsDirect.com, DorothyPerkins.com, and the rival DIY website from B&Q also came bottom of the heap in the survey. The most highly-rated shops were specialist retailers, led by LizEarle.com and RicherSounds.com. Which? said the popularity of smaller retailers' sites underlined the importance of offering a personal, convenient service that gave "shoppers exactly what they want". The group asked more than 10,000 Which? members to rate the most popular online shops based on experiences they had in the previous six months. Those surveyed were also asked to rate websites for experiences buying particular items and consider factors such as price, product range, deliveries, quality and the returns process. LizEarle.com got a rating of 94%, followed by four companies that got virtually the same score of 93%: RicherSounds.com, Rohan.co.uk, SeasaltCornwall.co.uk, and WexPhotoVideo.com. Beauty specialist LizEarle.com was praised for its natural "high-quality products", "excellent service" and "good money-off offers". The Liz Earle Beauty company was bought by pharmacy and health giant Walgreens Boots in 2015. The biggest major retailer to make the top 10 list of best websites was JohnLewis.com, placed sixth with a satisfaction score of 90%. Dyson.co.uk was seventh with 89%. Homebase.co.uk's satisfaction rating was 55%, followed by SportsDirect.com (61%), DorthyPerkins.com (61%), DIY.com (B&Q), (62%), WHSmith.co.uk (63%), and JDSports.co.uk (63%). 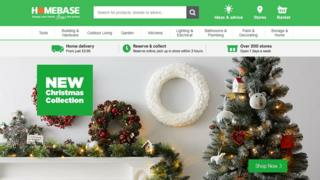 Homebase, which is undergoing a restructuring that will involve 42 store closures, said in a statement: "Customer feedback is really important to us, and we are working hard to make changes online to provide great service when customers shop with us." SportsDirect.com received mixed customer feedback. One shopper complained about "very poor quality" products, but others praised its cheap prices. 'It has a fair range at good value,' one customer said. Which? said that the best performers were those that treated customers well and offered a more personalised service. Harry Rose, editor of Which? Magazine, said: "The online shops with the happiest customers tend to be the ones that offer a personal service, quality items and deliver quickly and conveniently. "Where the big players are lacking, either with poor service or confusing websites, smaller more specialised online retailers have seized the opportunity to make their mark and give shoppers exactly what they want." Asked about online shopping generally, 68% of respondents said they did so because of convenience. Some 63% people said it was easier to find exactly what they wanted online and three in five (57%) also said they had more choice of products.